WP Fusion extends Convert Pro to allow you to target call-to-actions based on a logged-in user’s tags in your CRM. After designing your CTA, navigate to Configure » Target, and expand the WP Fusion section. 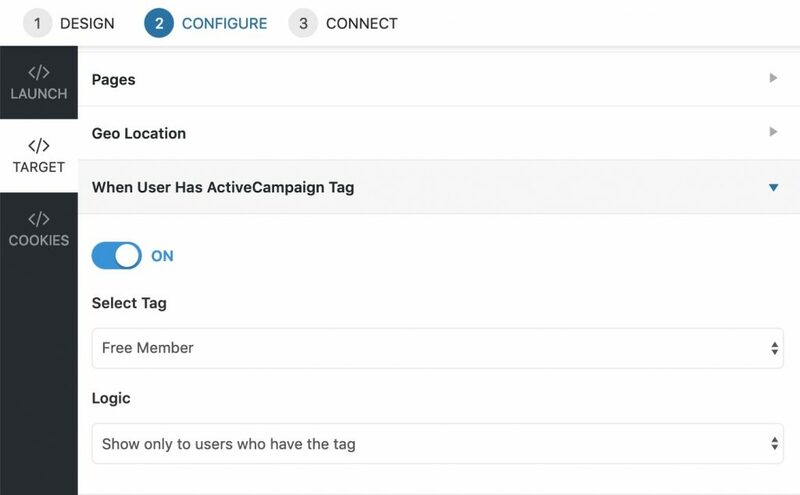 Once you’ve turned on the targeting rule you’ll be able to select a tag in your CRM from the dropdown. The default logic is “Show only to users who have this tag”. With this selected, the CTA will only be displayed when a user is logged in and has the selected tag. If you set the logic to “Hide from users who have the tag” the CTA will be shown only to guests and registered users who do not have the specified tag.